50th Reunion: A Reunion of a Lifetime! Class of 1969 - Save the Date! 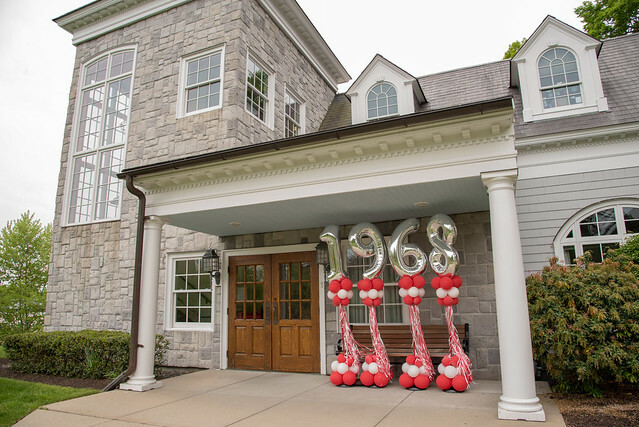 On May 18-20, 2018, the Class of 1968 celebrated their "Reunion of a Lifetime" with a record-setting 60 classmates returning home to campus for a weekend of Stag Pride! We can't wait to see you back on campus in June 2019 for your first Golden Stags Reunion! Congratulations! Class of 1968 Reunion Weekend! Class of 1969 - We're less than a year away to your celebration! Make plans now to come home to Fairfield. Scroll down to see this year's schedule of events, a list of Frequently Asked Questions and more so you can start getting excited about your big weekend! Photos from this year's festivities will be posted soon! For questions regarding 50th Reunion Weekend, please contact Colleen McGinn, Director of Alumni Engagement at (203) 254-4280 or cmcginn@fairfield.edu. Please note that all times, locations, and events are subject to change. Please check back for continuous updates on the weekend's festivities. Check in will close briefly at 4 p.m., it will reopen at 5 p.m. in the Lobby of Faber Hall. Welcome Luncheon with President Mark R. Nemec, Ph.D.
Join us for your official welcome back home to Fairfield at a special lunch hosted by University President Mark R. Neme, Ph.D. After lunch, President Nemec will give an update on the University. Visit the Campus Center and stock up on your Stag gear at the Spirit Shop; tour the Walsh Art Gallery at the Quick Center for the Arts or the Fairfield University Museum at Bellarmine Hall; visit the Egan Chapel of St. Ignatius Loyola; or enjoy some quiet time catching up with your classmates. If you would like to change for the evening events a hospitality suite will be available. Get re-acquainted with your classmates at the welcome back buffet dinner. Join your classmates for an informal breakfast and reconnect with each other. A complimentary buffet breakfast will be available from 8 a.m. - 10:00 a.m.
For those staying on campus coffee will be available at 7 a.m.
Join us for a guided tour of Fairfield University. Our tour will make stops at some of the the newly constructed and renovated Fairfield University buildings. Celebrate your official induction into the Golden Stags at this special ceremony with President Mark Nemec. Lunch will follow. Undergraduate academic regalia will be provided for your participation in Baccalaureate Mass. Alumni with graduate/advanced degrees are welcome to bring their own regalia. Join in congratulating the Class of 2019 in this long-time tradition by participating in the Mass procession. Reserved seating will be provided for you and your guest. Enjoy a hearty breakfast buffet and one more class photo as you don your caps and gowns and prepare for Commencement. March in the Academic Procession as Fairfield celebrates its 69th Commencement and the 50th anniversary of your graduation. Class of 1969 participants will receive special recognition. There will be reserved seating for your guest. Immediately following the Commencement Ceremonies, you and your guest will be transported back to the School of Business where you can grab a boxed lunch for the road or sit and enjoy your lunch with your classmates. *Details regarding Commencement in the event of inclement weather will be discussed when you arrive on campus. Please consider writing a short narrative of your “journey” since graduation. A collection of these reflections will be compiled and live on your Class's personal webpage after you become "Golden Stags." Even if you cannot attend your Reunion, we encourage you to submit an entry. Previous 50th Reunion classes have found these memories to be inspiring, and have appreciated the chance to reconnect with classmates and hear about their lives after graduation. We need as many entries as possible to make this project a success, and will continue to remind you to participate! • Call Colleen at (203) 254-4280 with any questions. Read what some of your classmates have already shared! Additional journeys will be added as they are submitted! Contact information for the following members of the Class of 1969 is missing from our database. If you know where your classmates are and/or how to get in touch, please e-mail alumni@fairfield.edu. Eternal rest grant to them O Lord and let perpetual light shine upon them. May these and all the souls of the faithful departed through the mercy of God rest in peace. What is the date of 50th Reunion? 50th Reunion Weekend 2019 is scheduled for Friday, May 17 through Sunday, May 19, 2019. How do I register for Reunion Weekend? Formal invitations will be sent in early 2019 to your preferred address and via email! Simply fill out the enclosed RSVP card and send it back to us at your earliest convenience. You may also register online when regisration opens. To update your contact information so you don't miss your invitation, you can contact us directly at alumni@fairfield.edu or by calling the Office of Alumni Relations at (203) 254-4280. Will I get a receipt and when will I receive my tickets? No tickets will be distributed prior to Reunion Weekend. You will pick up all your event materials upon arrival on campus on Friday or Saturday. All alumni who submit an online registration or provide an e-mail address on their reply card will receive a confirmation of their registration. How do I find out who's coming? The list of registered guests can be viewed on the online registration site when it goes live in 2019. What activities will be available for my classmates and me? View the full schedule of events. What is the price of 50th Reunion? Accommodations are priced by room not by guest. Cost is $50 per room per night. What are the on-campus accommodations and what is the price to stay overnight? We are able to accommodate guests on campus in suite style housing (one or two guests per room, extra-long twin bed(s), and a private bathroom). Guests traveling "Stag" are encouraged to indicate a preferred roommate on their registration form should space require double occupancy. Costs of our on-campus housing is $50 per room per night. Are there special Reunion Weekend rates and/or rooms reserved at local hotels? Update (April, 2019): Our room block at the Fairfield Circle Inn is at capacity. Additional rooms have been reserved at the Circle's sister hotel, the newly renovated Hotel Hi-Ho in Fairfield (4180 Black Rock Turnpike, Fairfeld, CT). Rooms are available at the rate of $199 per night (before tax) for Friday and Saturday. Space is limited and the rate is non-refundable. Rate expires on 4/16/19 or when full. To book, call (203) 259-5264 and reference "Fairfield 50th Reunion" or reserve online at Hotel Hi-Ho 50th Reunion. Note: Your Reunion coincides with Commencement weekend for not only Fairfield, but many local colleges and universities, so please be sure to book your room in advance. A list of additional local hotels is available online. Will we be able to bring a spouse/guest to our activities? You are certainly able and encouraged to bring a spouse/guest to Reunion. During Baccalaureate Mass on Saturday, your guest will have special reserved seating near you. For those participating in Commencement, your guest will receive reserved seating at the ceremony. Please note: due to high security and limited space, we are able to accommodate one guest only per person at Commencement. Is 50th Reunion Weekend accessible to those with special needs and/or dietary restrictions? All activities during Reunion Weekend (including Commencement) can be modified to accommodate anyone with physical and/or dietary special needs. Please inform the Alumni Relations staff of any special needs prior to your arrival by indicating them on your registration form online or on your reply card in the designated area. To speak to someone directly regarding your needs, please call the Office of Alumni Relations at (203) 254-4280 or Colleen McGinn, Director of Alumni Engagement at (203) 254-4000 ext. 2417 or cmcginn@fairfield.edu. Is there parking on campus? For those staying on campus, convenient parking near the campus housing will be provided. For guests driving to campus, parking will be made available to you when you arrive on campus for Registration. From that point forward, you will be transported to all 50th Reunion activities via campus transportation. Handicap accessible parking is available. Please make a notation of your need for such parking in your Reunion reservation. What is the dress code for Reunion? Dress code for the day time activities and Friday evening reception is casual. In the past, attendees have preferred to wear a suit jacket to the Golden Stags Induction Ceremony and Luncheon on Saturday however this is not required. Throughout the entire weekend please be sure to dress in layers and/or for all weather, as all of our activities take place rain or shine. There will be a secure room in the official 50th Reunion Dorm building if you are not staying on campus and wish to bring a change of clothes and private facilities for you to change in for evening activities. Can I view photos from last year's Reunion? Sure! Photo galleries from 50th Reunion: Class of 1968 are available by clicking here. You can also watch a video recap of last year's Reunion by clicking here. Take a look at all the fun you’ll be having in May. Want to revisit some of Fairfield's history before you return to campus? View our online University Archives & Special Collections through the DiMenna-Nyselius Library.